Ordnance Factory India is going to recruit fresher Indian candidates for various technical posts. There are total 36 vacant posts for Graduate Apprentices and Technician Apprentices posts. Those who have a completed 3 years Diploma or 4 years Degree in the Mechanical, Electrical and Civil stream can apply for these Government jobs in India. The process for applying these engineering jobs and diploma jobs is to apply offline with the prescribed application form. More information related to these Government jobs is given below in this article. What are the eligibilities Criteria’s of OFC Recruitment 2018? Indian candidates having a Degree in Engineering or Technology in relevant stream can apply for this Ordnance Factory Recruitment. Diploma Holder in the specific stream can apply for these Government Jobs in India. Great news for all who wants to apply for these Government jobs; there is no need to pay anything for applying. 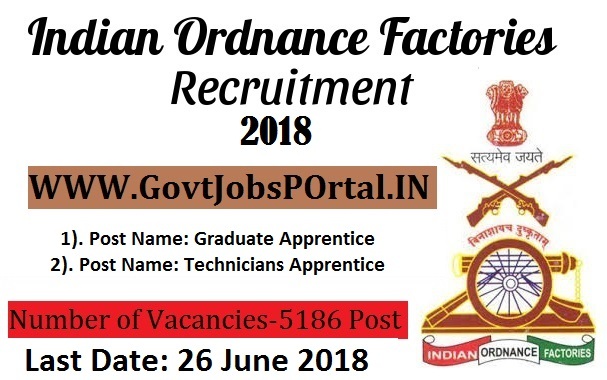 Zero application fee for applying this Ordnance factory recruitment 2018. How Candidates will be selected for these Job profiles? Those who cleared these two rounds will be recruited for these job profiles. How to Apply For This Indian Army Recruitment 2018? pin-442501 on or before 26.05.2018. 26st June 2018 is the Last Date to Apply.